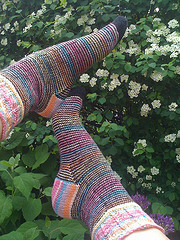 Here are my lovely Laurelhurst socks in purple and black with always 2 rows per stripe. The pattern is from ravelry and I followed it closely except for the heel and the toe decreases. 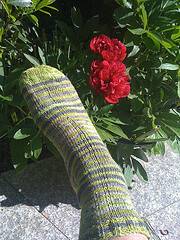 ….and here is my second pair of Laurelhurst socks. This one I modified a lot more. I didn’t do the slipped stitches along the sides and also used a different pattern for the heel and toe. Below is my pair of crazy stripes socks. I used two different multicolores yarns – one with different shades of blue and the other with various shades of pink, yellow, orange, lilac and blue – and worked 4 rounds before switching to the next color. I just love how they turned out and they are supercomfy to wear. At the moment I’m working on the green and black-white-gray striped socks for K. Basically it’s the same pattern as my crazy stripes socks, only in this case I’m switching colors after only 3 rounds. 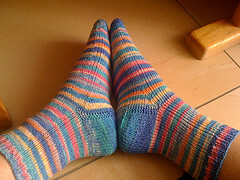 And I’ll probably start the second sock with the black-white-gray yarn and also do the heel and toes in this color. And finally here is my sock yarn blanket, which of course is still very much in progress. 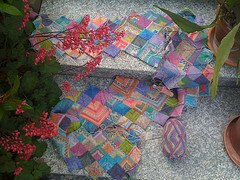 At the moment I’m working on the 6. row of squares and it’s still a lot of fun…. though I need an occasional break from doing them, as you can see by the amount of socks I’ve done lately.